(Bloomberg Opinion) -- Wynn Resorts Ltd. has dodged a bullet by scrapping a $7.1 billion bid for an Australian rival, but the casino giant founded by billionaire Steve Wynn shouldn’t quit the gunfight just yet. With growth prospects in Macau shrinking and its license there coming up for renewal, the Vegas-based operator is right to think about diversifying its overseas presence – even if the abandoned offer for James Packer’s Crown Resorts Ltd. was far too generous. Wynn has no casinos outside the U.S. other than Macau, where its focus on Chinese high-rollers looks a little shaky given the slowdown in China’s economy. It might also be forced to take on local partners in Macau when the gaming licenses are re-awarded in 2022. That A$9.99 billion price tag for Crown, valuing its debt and equity at about 12 times forward earnings, was clearly excessive for an essentially Australian operator struggling with its own sales declines because of dwindling numbers of Chinese customers. But that it was even countenanced at that value tells you plenty about the tight strategic corner in which Wynn finds itself. It wouldn’t be a shock if the deal was reactivated. Wynn’s other big potential option is Japan, which has recently legalized casino gambling. 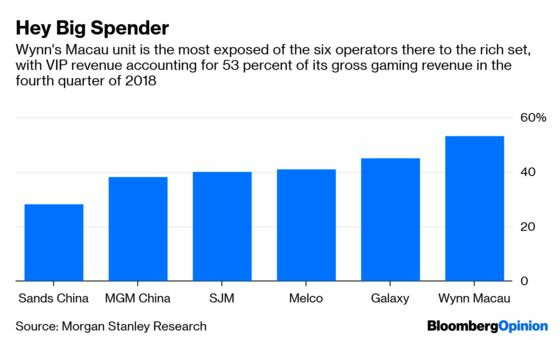 Unfortunately for the U.S. operator, the country doesn’t look a good fit with its high-rollers business model. While Japan is planning to award three licenses to build “integrated resorts,” these would have to cater to the mass-market end of the gaming scene (think of the millions of Japanese addicts of Pachinko slot machines). This is the faster-growing part of the industry, and Wynn is trying to attract more of these casual, small-money gamers, but high-rollers are where it made its name and where it’s more at home. Singapore, another big casino market, remains out of reach for Wynn for the next decade, with the licenses held by Las Vegas Sands Corp. and Genting Singapore Ltd. not up for renewal until 2030. The Philippines, meanwhile, is often a regulatory quagmire, with President Rodrigo Duterte blocking a big casino project there. As such, you can see why Australia has appeal as a second front in the all-important Asian gambling market. 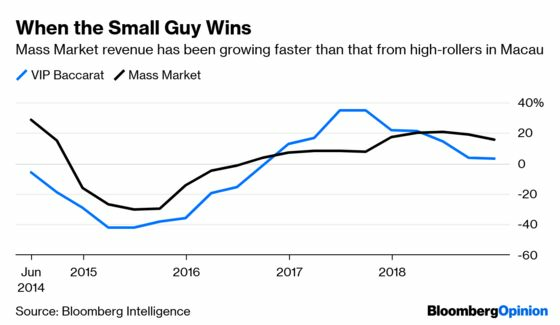 The country may be suffering a slowing economy, a loss of confidence among Chinese tourists and the competitive threat from Japan’s new casinos, but it remains the world’s third-largest gaming market by revenue. Crown is building a A$2.2 billion casino on Sydney’s waterfront that will probably be more of a draw for rich Chinese gamblers than its existing operations in Melbourne and Perth. Whatever the case, Wynn may have to buy if it doesn’t want to be bought itself. Sands has moved well ahead on the mass-market gaming experience that’s dominating the industry now. And Wynn has some juicy assets. Genting, which is facing a tax hike in Singapore, has long lusted after a Macau presence, for instance. Another U.S. rival, Caesars Entertainment Corp. is being pushed to sell itself by activist Carl Icahn, so the merger game is in full flow among the operators. Wynn didn’t take the Crown this time, but it’s worth another look.